During the 2 1/2 hour train ride from Melk to Salzburg, we had plenty of time to enjoy the schnitzel sandwiches we had salvaged from last nights dinner. None of our train rides were to be longer than 3 hours, most were considerably shorter. The changing scenery was glorious; we find this mode of travel a wonderful way to fully appreciate the wonders of nature passing us by. We were staying in the Mirabell District on the north bank of the Salzach, which runs picturesquely through the city. The Hotel Crowne Plaza - Pitter is a 10-minute walk from the train station. It is conveniently located across from the Salzburg Congress, near Mirabell Garden, and just a 10- minute walk to the old city center across the way. Our check-in was friendly and efficient. There is an internet point next to reception that can be used at no charge for 5 minutes. This was the only hotel we stayed in that did not have unlimited free internet access. We have never found that guests take unfair advantage when they know others are waiting. Our lovely room, with well-chosen, good-quality furnishings and excellent lighting, had a cabinet dividing the sitting and sleeping areas. The TV was on a swivel, thus viewable from either direction. The toilet was in a separate room next to the bathroom, which was well-stocked with amenities and towels. Bathrobes were available for use at the indoor pool and wellness facilities. A pant presser, iron/ironing board and coffee/tea maker rounded out the comforts. Breakfast had it all plus a few special extras, such as smoked salmon and made-to-order waffles, omelettes and pancakes. The buffet was well maintained and the service was very good. Armed with our Salzburg Card, which is good for free use of public transportation in the city and lots of free admissions and discounts, we hopped on bus #25 for a visit to Hellbrunn. The Archbishop Markus Sittikus did not build the Hellbrunn Summer Palace as a residence or for governing, but solely for pleasure. The Park of the Palace is a paradise of groomed lawns, hedges, trees, shrubs and waterways - a retreat, a place to stroll, relax and contemplate. We met a nice lady at the bus stop and she told us she visits regularly for just that purpose. It's also a place for families, with childrens play areas and most important the world-famous trick fountains. "Dark grottos, mystical sculptures, graceful fountains and a special feast for the eyes, an intricate mechanical theatre magically come to life powered by water." I am quoting this as the trick fountains were closed for the evening so we did not experience the thrill first hand. The nice lady also recommended the Stieglbrau, Rainerstrasse 14, a few steps from our hotel, for dinner this evening. What wine is to the Wachau, beer is to Salzburg. This typical beer tavern consists of the braustube (saloon), where we joined the happy diners, a beer garden, and a festival room for special parties. A Konig Ludwig Dunkel, luscious dark beer, got us into the Salzburg lifestyle. We decided to share two traditional favorites, herring and tafelspitz. The herring filets were served with boiled potato, smothered in sour cream and garnished with onion, apple, pickle, tomato and lettuce. Keep the beer flowing! Tafelspitz is plain and simple boiled beef in natural herbed broth with vegetable and potato, served with a side of white horseradish sauce. The herring was excellent but the tafelspitz was a bit too bland for my taste. The apple strudel competition continued with a very good rendition accompanied by schlag and vanilla ice cream. Good stuff at good prices, good value. I should point out that so far we had been starting our evening meal between 18:30 and 19:30 and in most cases found the restaurants already busy. Eating times here are similar to those at home in Toronto. 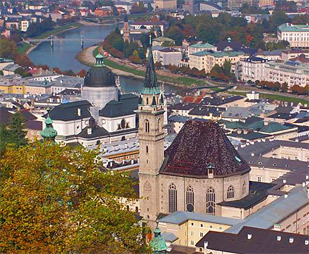 Salzburg is a very unique city by virtue of its rich culture of world class music. Wolfgang Amadeus Mozart was born and studied composition here and his and other great composers works can be heard in every concert hall, church and palace in this metropolis of architectural beauty. The famous Salzburg Festival, dating back to the beginning of the 20th century, has attracted audiences from around globe. The mountains of Kapuzineberg to the north and Monchsberg to the south with the Salzach flowing between create a stunning landscape to house this citadel of music, culture and beauty. As we walked through the city, one thing became abundantly clear: Mozart is everywhere! On Jan.27th the year-long celebration of the 250th anniversary of Mozart's birth gets underway and there are restoration and construction projects, sworn to be ready on time, everywhere. 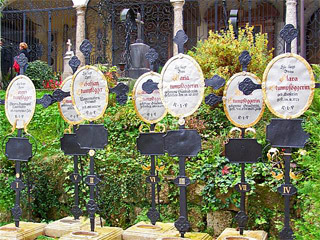 If you love the music of Mozart, 2006, more than ever, is the time to visit Salzburg. We started our walk in the Mirabell District at the Palace and Gardens. The Marble Hall of the Palace, built in 1606, is said to be the "most beautiful wedding hall in the world". The French Baroque Garden with its maze, rose garden, and sculptures was a delight on this beautiful day. The Dwarves Garden offers a whimsical diversion while the Hedge Theatre is the oldest garden theatre in the German world. Beside the gardens, the Mozarteum Foundation, for studying everything and anything related to the great composer, is adjacent to the Salzburg Marionette Theatre where performances by marionettes run the musical gamut, specializing in Mozart operas, naturally. Linzergasse is a vibrant pedestrian shopping street that runs alongside Kapuzinerberg from which there is a pathway lined with the Stations of the Cross that leads up the mountain for great views. The St. Sebastian Cemetery, located next to the church of the same name, was brilliantly designed by Andreas Berteleto in the style of an Italian "campo santo". Long arched corridors are lined with sculptures and plaques on the pillars and walls in memory of those interred here, among them Mozart's wife Constanze and his father Leopold. When the Mozart familys first house became too small they moved to Makart Square 8. Mozart lived in the house from 1773-1780. There is a multi-media museum on the first floor documenting the history of the building and the life of the family. We crossed the river via the pedestrian Markartsteg to Griesgasse and passed through one of the narrow, store-lined arcades that connect to Getreidegasse, Austria's most beautiful shopping street. Intricate, beautifully decorative wrought iron signs, originally designed as a means identifying, for illiterate citizens, the wares sold within or the name of the owner, overhang the street. It is said that the M within the McDonalds sign is made of solid gold for a lasting heritage. Within the charm of this old world architecture is some of the finest fashion and food found anywhere. Stroll through the arcades on either side of the street and youll find wonderful boutiques, cafes, food shops and restaurants waiting to be discovered. We passed through one such arcade to the market place behind which was filled with mobile food stations and stands offering a large array of foods to be eaten at stand up tables, while strolling along or at home. Still sated from the substantial breakfast, we didnt indulge. The Festival District is just behind the market running along the base of the Monchsbert. The huge festival hall, site of the largest festival productions, is being enlarged to accommodate the Haus for Mozart as part of the 2006 celebrations. 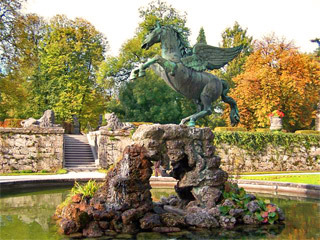 The well-known horse pond, toy museum and St.Blaise's church are right nearby. Continuing along the base of the mountain we came to St. Peters Abbey, Cemetery and Catacombs in the Fortress District. The church and monastery, founded around the year 700, is the oldest continuously-active monastery in the German world. The interior of the church is Romanesque style with the Rococo decoration reflected in the large number of alters. Music and theatre was avidly fostered and in 1769, at the age of thirteen, Mozart composed the Dominicus Mass for Abbot Hagenauer; in 1783, Mozart personally directed his famous Mass in C-Minor. The cemetery, with its arcades, artistic wrought iron gates, lovely landscaping and memorials has a mystical appeal that has always attracted visitors. Departing via the rear exit of the cemetery we came to the rushing waters of the old, still-working water mill. Next to the mill is Al Teste Backerei, the oldest bakery in the city, where they bake dark bread, which locals buy warm from the oven to be kept for a day before eating. The Hohensalzburg Fortress sits high on the mountain above and is reachable by the funicular or by foot. With our Salzburg cards, well opt for a free ride up tomorrow. Passing into the Cathedral District we were awestruck by the design and setting of the cathedral. The reconstruction of the original medieval cathedral, destroyed by fire in 1598, began in 1614 and was completed 14 years later. The architect, Santino Solari, combined Baroque and Italian design to create a twin towered, high domed stunning structure on the edge of the large, attractive Dom Platz. This is the only church in the world to have 5 fixed organs; it's the Mozart effect. Mozart was the church organist who composed his music for the masses. The adjacent ResidenzPlatz, the largest square in town, is home to the magnificent archiepiscopal Residenz, with its state rooms and gallery. The new Residenz and Salzburg Carillon sit across the way. The famous horses and buggies of Salzburg are parked here, waiting to be hired by deep- pocketed tourists. Next door Mozart Platz is dominated by the Mozart memorial erected in 1842, a special place for listening to the world famous Salzburg Carillon which sounds daily from the archbishop's palace. After all this activity we were hungry and scurried back down Getreidegasse past Mozarts birth home, which now houses the Mozart Museum, to that narrow passageway where we earlier had spotted Zum Wilden Mann, Getreidegasse 20, as a possible lunch place. The tables were filled with Salzburgs finest, from tradesman to business people all with one thing in common, a love of home style cooking and beer. We shared a table with a fellow buried in his newspaper. Stiegl beer (the largest brewery in the country) was a good way to start. Linda had a farmers soup, clear beef broth loaded with beef, vegetables and noodles plus a mixed salad. I had my first bratwurst in Austria with amazing sauerkraut and home fried potatoes. The apple strudel arrived buried in powdered sugar, which we returned for a naked serving. The filling was good but the dough a bit too thick  out of the running for our contest. With excellent service, this place definitely offers very good value in all respects. We walked off lunch exploring all the nooks and crannies of Getreidegasse, wandered though the picturesque alter markt past Cafe Tomaselli, the oldest cafe in the city, and made a visit to Franziskaner Kirche, one of the citys oldest churches. Most impressive is the height of the massive stone pillars and archways and the striking pink and gold high alter. The Staatsbrucke is the main bridge from the old city to Mirabell. At the end of the bridge is the Hotel Stein which has a rooftop terrace cafe from which there are excellent views of the old city in the shadow of Kapuzineberg from which Linda made her digital magic. Tonight we would have a special treat attending a Mozart dinner concert in the Baroque Hall of St.Peter's Monastery Cellar. The Peterskeller is known as the oldest restaurant in Europe and is very popular with locals and tourists. The ancient environment is exceptional and judging from our dinner the food is very good. The Baroque Hall was a perfect venue for this event. The string quartet and singers were young music students who performed brilliantly. The program started with a selection from "Don Giovanni". The first course was a lemon cream soup with cinnamon followed by a selection from "Le Nozze di Figaro'. 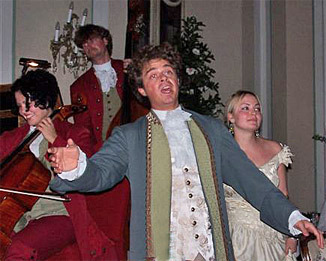 The main course of roasted capon with lovely vegetable preparations was followed by a selection from "Die Zauberflote". A semi-frozen parfait of honey finished the evening. Seductive music, very good food and of course excellent white wine from Wachau made for a delightful evening. The Hohensalzburg Fortress, Salzburg's landmark, is the largest preserved citadel in Central Europe. The panoramic view over the city and countryside is wonderful. The state rooms are a fine example of late Gothic architecture. Of particular note were a spectacular, large Majolica stove and an adorable puppet museum. Tucked into an arcade at Getreidesgasse 3 is Schatz- Konditorei where we found the most perfect baked goods. Apfel strudel was composed of the freshest-tasting, most delectable apple and raisin filling wrapped in perfectly- textured pastry, served at room temperature as is my preference. Topfen (soft, spreadable German cream cheese with a tangy flavor) and raisin strudel, was of a texture and flavor not to be met again. The coffee was as good as it gets. Do not miss this slice of heaven. At the end of Griesgasse at the base of Monchsberg is the entrance and elevator to Museum der Moderne Salzburg Monchsberg, the Museum of Modern Art. The contemporary design of the building, done in a light local marble, is in stark contrast to Baroque Salzburg and befits its new place in the cultural life of the city. The views from the sculpture terrace capture all the glory of the ensemble that is Salzburg. There are four levels of space exhibiting 20th and 21st century art as well as presentations of the Austrian Photo Gallery. The Restaurant Monchsberg 32 with a large open air terrace is located on the 3rd level. We walked through the mountain forest behind the gallery in the direction of Mulln to our destination the Augustiner Brau, Augustinergasse 4. We were invigorated by the smell and beauty of nature around us. There are many trails through this gorgeous area for walking, hiking, and biking and best of all you can always finish with Augustiner beer. The brewery was founded in 1621 by Augustine monks and is known today as the Braustubl at Mulln. The brewery is just behind the four large beer halls and beer garden, with three smaller rooms and others for special events. Food is not served in the beer halls but there is a wonderful selection of local specialties available for purchase from small shops along Standlgang Row, just outside the halls, which may be taken inside to be enjoyed with the beer. Two sizes of beer steins are stacked neatly in wall racks. Select your stein, pay the cashier (2.50 or 5.00 euro), rinse your stein in the fountain and proceed to the counter where it will be filled directly from a wooden keg. Crafted from an ancient recipe, unpasteurized, free of additives and brewed exclusively from the finest barley, hops, yeast and water (it should be noted here that the water throughout Austria is of the highest drinkable quality), it is quite delicious, particularly when accompanied by a sausage on a bun that my partner acquired from one of the shops while I carried our beers to a table. Brauststubl Mulln is a neat experience that should be appreciated while in Salzburg. 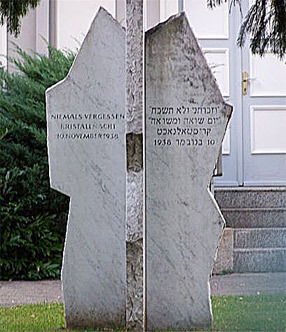 We visited the Synagogue at Lasserstrasse 8, but since it is only open for services on Friday evenings and Saturday mornings for the Sabbath, we had to settle for photos of the exterior and the Kristallnacht memorial monument. This Synagogue was built in 1893 and is still active servicing the approximately 100 Jewish people in the community. Judengasse is an extension of Getreidegasse and documents from the 12th century describe it as the "alley of the Jews". The original Synagogue was located at #15. Tonight we would attend the Salzburger Schlosskonzerte at Schloss Mirabell, so we chose the nearby restaurant Stadtkrug, located in the hotel of the same name at Linzergasse 20, for dinner. The atmosphere is sedate and the menu traditional. I started with a very good soup with a strudel of minced beef that was hearty and tasty. Linda, in wiener schnitzel mode, was happy to be able to substitute a bread dumpling for the boiled potato. I had roast lamb which was tasty but a bit chewy. The polenta with parmesan and creamed spinach were good. The food and spotty service did not justify the price. The program for the wonderful concert was a selection of the brilliant works of Wolfgang Amadeus Mozart and Franz Schubert performed by the famous Minetti Quartet. This was a perfect way to end our stay in this fascinating city of music, culture and beauty.